Along with standard duties of the Local Church, we have a strong burden to reach the lost in Portland, to send the light in a city of darkness. Although our ministry list is small, the Lord has blessed, and we’ve seen his hand work in seeing dozens of people get saved. 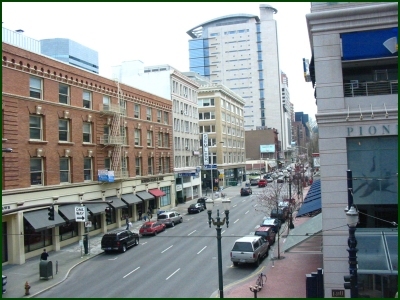 On Saturday nights, some of the men grab a handful of gospel tracts, pray, and head into downtown Portland. There are plenty of places for open air preaching, witness, and gospel tract distribution. It’s plain to see the power of God described in I Corinthians 1:18. Likewise, once a month we go out in the daytime, where we focus on more hand-to-hand tract distribution, and personal witness. This provides a great opportunity for the ladies, and children in the Church, to participate, and learn first hand, by spreading the gospel, winning souls to Christ, and being a soldier in the Lord’s army. We have a very strong desire to bring folk into the Church, saved or lost, regardless of race or religious background. We do this with the intention that the saved will grow spiritually, and that the lost will get saved, and then to grow. On Thursday evenings, we go door to door, in various neighborhoods around the Church, offering a free gospel tract, personal witness, and inviting folk to come out to services on the following Sunday, or Wednesday. Even though we may not always see the increase of these ministries, it doesn’t mean that there isn’t results. We have faith that people are getting saved, and growing spiritually, even if we can’t see it. If you live in, or near Portland, and are looking for a church, we strongly encourage and invite you to come visit. “For the invisible things of him from the creation of the world are clearly seen, being understood by the things that are made, even his eternal power and Godhead; so that they are without excuse:” — Romans 1:20 . Powered by BibleGateway.com.